How Do I Video Interview...Candidates With a Negative Digital Footprint? How Do I Video Interview…Candidates With a Negative Digital Footprint? Every candidate comes with their own set of unique interviewing challenges. That’s why we’re tackling how to video interview different types of job seekers with this how to series. Today, we’ll be talking about how to connect with job seekers with a less than ideal digital footprint. Who hasn’t Googled themselves from time to time? Doing a quick Google search of a top candidate’s name is just second nature in today’s digitally-connected world. The online presence of your top talent can certainly tell you something about the individual’s personality and responsibility level. In today’s world, leaving your Google results to chance just doesn’t make sense. In fact, a recent article on Forbes delves into why job seekers should care about their online presence. According to stats from Comscore quoted in the article, nearly 90 percent of U.S. Internet users visit a social media website each day. And the digital footprint left behind just might help you differentiate between good and bad job seekers. So once you’ve seen examples of a negative digital footprint, how do you address this issue in the video interview? You don’t want to lose out on a great candidate because of one misplaced tweet, but you also don’t want to hire someone who can’t even manage their own online presence. Address their online presence: If you were concerned by the negative picture painted by a candidate’s online presence, the video interview is a great place to let job seekers explain themselves. You don’t want to miss out on top talent just because they’ve made a mistake on social media. Still, big blunders in a candidate’s digital footprint need to be addressed sooner rather than later. Use the video interview as a space to air your concerns and listen to the candidate’s explanation. Perhaps what you saw was several years old. Maybe those pictures of your candidate at a keg party were from college or the job seeker didn’t even know they existed. The important aspect is to be honest in the video interview about what you saw and how it concerns you. Look for professionalism, and watch for defensiveness: If the candidate feels cornered, they might react in a negative fashion. This is truly telling about how the job seeker will handle stressful situations or criticism of their work. Watch their body language in the video interview for signs of defensive behavior or open communication. If the candidate is honest and professional in their answers, this is a good sign. Every mistake is an opportunity for learning and growth. If the candidate takes that track, you might have a great hire on your hands. However, if the candidate gets overly defensive it’s likely this person would have a negative impact on your company culture. State your social media policy: A candidate with a negative digital footprint might present the perfect opportunity to get crystal clear about your company’s social media policy in the workplace. Use the video interview to inform the candidate about your organization’s social media do’s and don’ts. This way you, as an interviewer, can spin a negative into a positive. You can use the candidate’s less-than-ideal online presence and turn it into a teachable moment. Not every candidate with a negative digital footprint should find their video resume in your email trash bin. Instead, use the video interview as a platform to address your concerns and evaluate whether this was a one-time mistake or an ongoing problem. 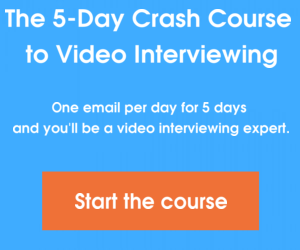 How would you use the video interview to evaluate job seekers with a less than ideal online presence? Share in the comments!